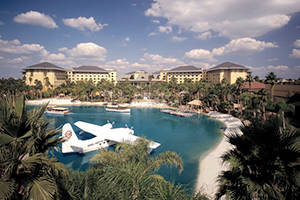 Kick back and relax in a tropical paradise at the exotic Loews Royal Pacific Resort at Universal Orlando®. From the breathtaking beauty of the lush tropical landscaping and sparkling waterfalls to the serene tranquility of the orchid court where flowers are always in bloom, you’ll be transported to the enchanted isles of the South Seas. Find a spot at the tropical lagoon-style pool, kick off your shoes and forget about the rest of the world at the Royal Pacific Resort. Enjoy 335 square feet of tropical paradise in one of our inviting Standard Guest Rooms. Each offers king bed or double queen bed accommodations, and a wealth of exceptional amenities. 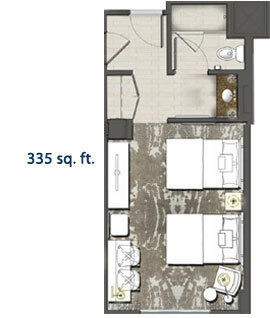 It’s all the comfort and amenities of our 335 square foot Standard Guest Rooms, with a view. Gaze out upon the hotel’s spectacular lagoon pool or waterway.